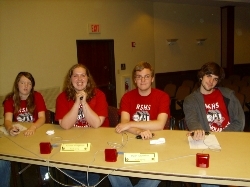 Description: Scholar Bowl can be characterized as competition in which subject matter in multiple academic disciplines (sciences, mathematics, social studies,literature, fine arts, performing arts, language arts, and miscellaneous) are used. This activity features head to head team competition, quick response answers, time limits on questions and use of recognition systems by participants. Requirements: Anyone interested may participate. Events: Tournaments are scattered throughout the year. See the attached schedule.